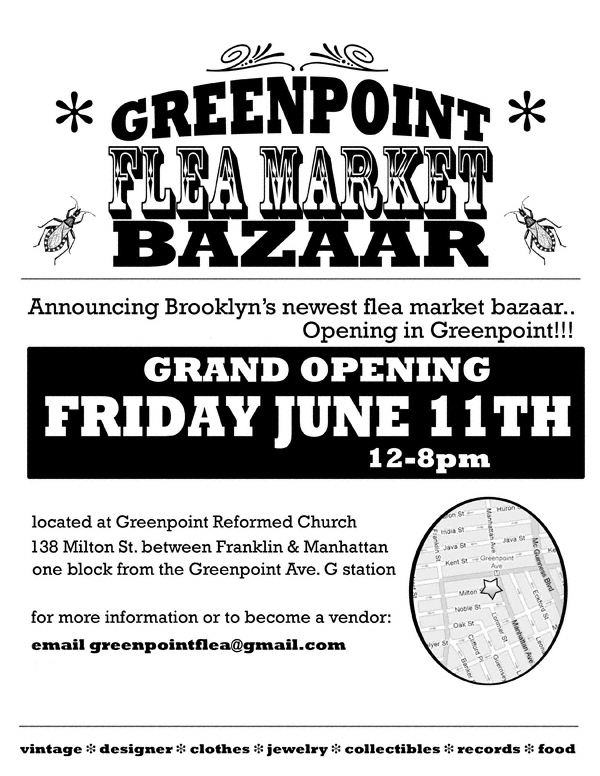 Announcing the Grand Opening of Greenpoint Flea Market & Bazaar , a new Friday Flea Market located on the scenic grounds of the Greenpoint Reformed Church located at 138 Milton St. Between Franklin and Manhattan Ave just one block away from the Greenpoint Ave. G train stop. Opening day will be Friday June 11th from 12-8pm. The market will be both indoors and outdoors and feature vendors selling a variety of goods ranging from antique bric-a-brac to vintage costume jewelry, from records to designer clothing and much more. We want to grow an amazing flea market that promotes the neighborhood, supports local businesses, and helps build community while offering unique treasures, delectable eats, and a fun atmosphere for all. With a diverse group of vendors already signed up from throughout the tri-state area, this will surely be a market that has something for everyone. Please feel free to contact us with any further questions about the market.